In school years my friends and I have been taking pleasure in coming up with catchy names for over-the-top devices marrying down-to-earth functions with futuristic and often tasteless options. One of these imaginary appliances was an unusual combination of toilet bowl, high-end sound system and ability to propel itself on rough terrain. 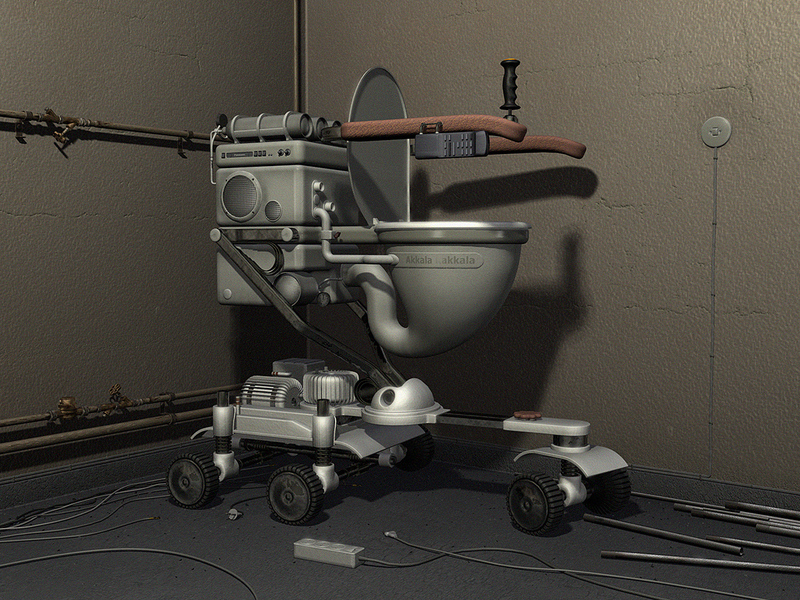 We’ve called it “Self-propelled Stereophonic Lavatory Pan”. Decade later I’ve spend some 300 hours during 9 months period of time to create a visual representation of this device. Image got attention on the interwebs as well as in press and spent some time in top charts on the Russian sites dedicated to 3D graphics. Image was also featured on official Assembly 2002 DVD and published in now discontinued Bikini magazine.